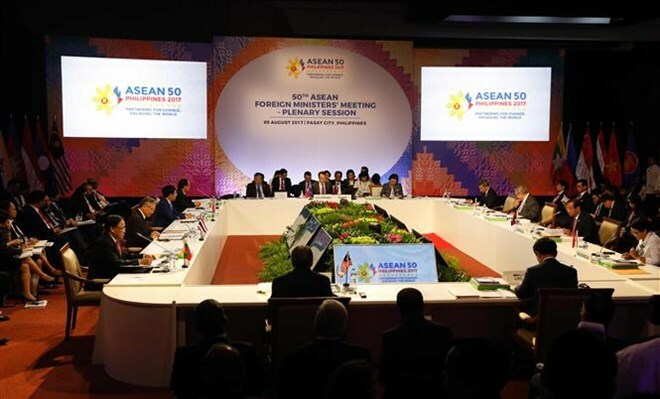 Hanoi (VNA) – Representatives of the 10 ASEAN member countries at the 50th ASEAN Foreign Ministers’ Meeting (AMM) have criticised the missiles and nuclear weapon programme of the Democratic People’s Republic of Korea (DPRK). In a statement issued at the meeting, which opened on August 5 in the Philippines, the foreign ministers expressed their concerns about increasing tension in the region after two ballistic missile tests of the DPRK last month. They also urged the DRPK, a member of the ASEAN Regional Forum (ARF), to strictly abide by relevant resolutions of the UN Security Council and have constructive, practical actions to contribute to the maintenance of peace, security and stability in the Asian-Pacific region. Earlier, the DPRK affirmed its launch of Hwasong-14 ballistic missile on July 28, the second consecutive launch of its intercontinental missile. The AMM 50 and related meetings will run until August 8. On August 7, foreign ministers of ASEAN and 17 dialogue partners are scheduled to meet at the ARF – an important multilateral security dialogue – to discuss hot issues in the region.